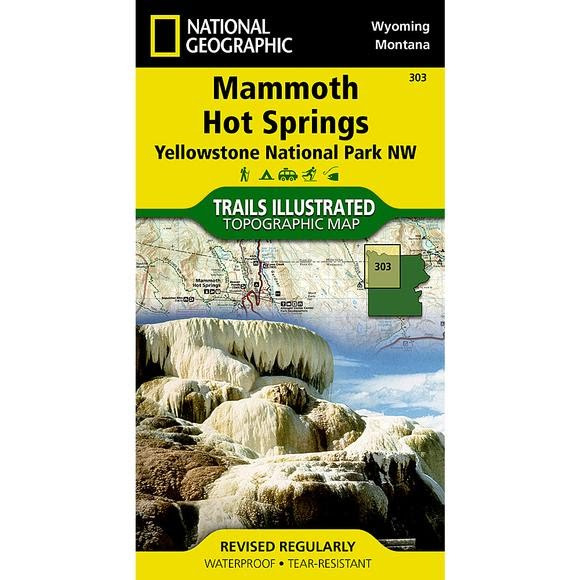 National Geographic's Trails Illustrated map of the Mammoth Hot Springs area of Yellowstone National Park is designed to meet the needs of outdoor enthusiasts with unmatched detail of the north-west section of the national park. National Geographic&apos;s Trails Illustrated map of the Mammoth Hot Springs area of Yellowstone National Park is designed to meet the needs of outdoor enthusiasts with unmatched detail of the north-west section of the national park. Expertly researched and created in partnership with local land management agencies, this map features key points of interest including the Mammoth Hot Springs area, Canyon Village, South Entrance Station, West Yellowstone, Upper Yellowstone Falls, Gallatin National Forest, Absaroka-Beartooth Wilderness, and Lee Metcalf Wilderness. With many miles of mapped trails and marked Bear Management Zones the Mammoth Hot Springs map can guide you off the beaten path and back again. The clearly marked trails include mileages between intersections. The map base includes contour lines and elevations for summits, passes and many lakes. Some of the many recreation features include: visitor centers, campgrounds, trailheads, boat ramps, and interpretive trails. Other features found on this map include: Absaroka-Beartooth Wilderness, Crowfoot Ridge, Gallatin National Forest, Grouse Mountain, Lee Metcalf Wilderness, Lower Falls of the Yellowstone River, Mount Holmes, Ramshorn Peak, Yellowstone National Park.